4 Pics 1 Word Tied Soccer Game. Hand Drawing with a Pencil. Drawing a pistol from a hip holster. Childs drawing of a Sun with Chalk. Find the 4 pics 1 word answers you need and still have fun with the game that has hooked millions of people. 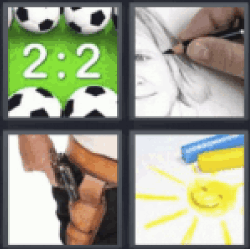 4 pics 1 word tied soccer game.